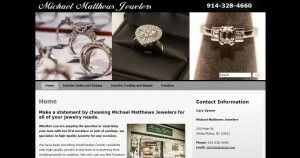 Michael Matthews Jewelers address, phone, website, hours of operation, and more. Make a statement by choosing Michael Matthews Jewelers for all of your jewelry needs. Whether you are popping the question or surprising your teen with her first necklace or pair of earrings, we specialize in high-quality jewelry for any occasion. We have been providing Westchester County residents with high-quality jewelry in the form of everything from wedding bands to watches. Not only can you find Pandora Jewelry to purchase from us, but White Plains, NY residents can also exchange jewelry for cash. Make Michael Matthews Jewelers your first stop shop for all of your jewelry needs. You may be asking yourself, “Where can I sell my jewelry to get a little extra cash?” We swap cash for gold and take those mismatched, broken or antique pieces of jewelry off your hands. Turn to Michael Matthews Jewelers to sell gold pieces of jewelry. Michael Matthews Jewelers specializes in engagement rings and precious stones. We know you want the best for your loved one, and we continue providing the best quality stones. We guarantee you will find the perfect ring to go with your future bride’s personality here at Michael Matthews Jewelers. We have been providing Westchester County with top rated jewelry for years. We can handle all of your jewelry needs from repairs such as cleaning memorable antique jewelry, replacing watch batteries, and fitting necklace chains and clasps. We do what other jewelers cannot by providing you with family like service while keeping gold, silver, platinum and more jewelry in stock. Stop by today to pick up a little something for yourself or to exchange your old jewelry for cash. We are Now Selling Pandora Bracelets!